Seattle, WA, October 4th, 2018, Active Grow, the sustainable horticultural lighting manufacturer was recently featured in Greenhouse Grower Magazine’s Latest Innovations in Lighting Tech Report. 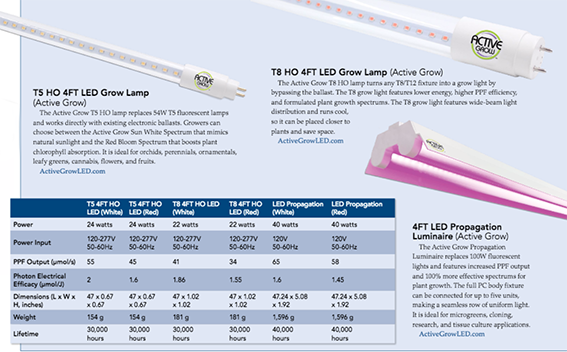 The Active Grow T5 24W HO 4FT LED Horticultural Lamp, T8 22W HO 4FT LED Horticultural Lamp and 40W 4FT LED Propagation Luminaire were all present in the report due to their energy savings, high photon efficiency and formulated plant spectrums. Check out the online version of the report here. The PDF version of the report can be accessed here.